Times have really changed. We have witnessed how technology has evolved from the basics to almost a way of life these days. Everyone, from students to business owners take to the internet to conduct their businesses. It is said that they are using the net as their new "revenue channel". I myself, set up a small business online which caters to mostly online customers. Apparently, e-commerce has become a necessity. That is why, we need to see e-commerce as a strategic means to achieve economic growth and that it has a big influence in our country's GDP. However, few professionals today really understand E-commerce and how it can help improve their businesses. You see, there are almost a few to none schools and institutions who offer programs regarding e-commerce and its' benefits. 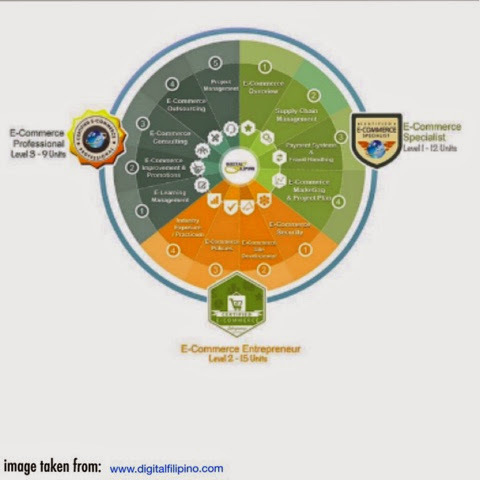 The upside though, is that there is a person such as Ms. Janette Toral of Digital Filipino who collaborated with Asian Institute of E-Commerce and AIE College to launch a program that could help students become certified in E-Commerce. This program will offer trainings that can teach professionals to gain knowledge about business models, supply chain management, buyer persona creation and many more. Enrollees can choose to take the course online or through face to face lectures. Students will receive credentials of either Diploma in E-Commerce or Bachelor of Science in E-Commerce. Credits can be earned in different ways, visit Digital Filipino for more information. The FEE per module is P3,000 (three thousand pesos) except for Module 8 which is P6,000 (six thousand pesos). You will get BIG DISCOUNT if you pay it in cash for 11 modules. The total cost is P30,000.00. GOOD NEWS for my loyal blog readers who are interested to enroll, we will offer 10% discount. Just fill out the form provided below to receive a special billing. If you want to receive a 10% discount for the Certified E-Commerce Specialist, Entrepreneur and Professional Training Program, just fill up this form and a discounted billing will be sent to you. Janette Toral will send an email confirmation link to ensure no one is adding you without consent. Kindly check your BULK OR SPAM folder in case it doesn’t arrive in your inbox. Once confirmed, you will receive an e-mail that has the discounted e-mail billing.